Caryophyllene oxide is a terpene found in cannabis, hops, pepper, basil and rosemary. As an active compound, the terpene caryophyllene oxide is used as flavouring additive and health supplement. 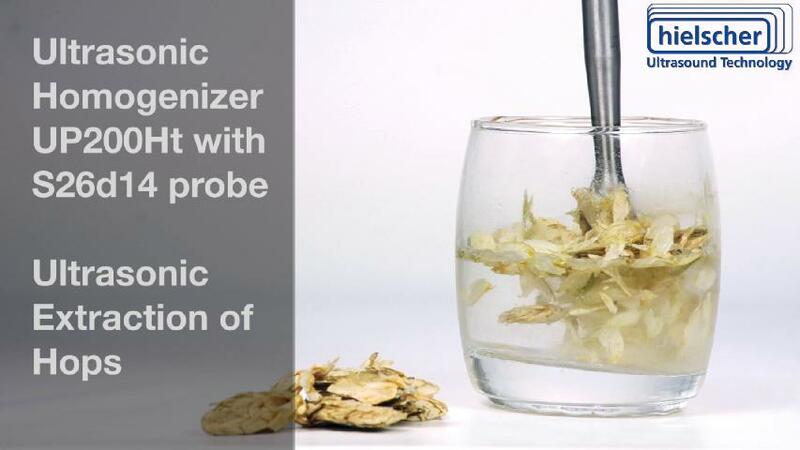 ltrasonic extraction has been proven to give high yields of caryophyllene oxide, e.g. from cannabis and hops. Caryophyllene oxide is distinguished by its aromatic smell and taste (i.e. herbs). Due to its intense aromatic smell and tast, it is often used as a flavouring additive in foods as well as a fragrance component. Furthermore, it also has the capability of binding with the endocrine CB2 receptors in the human body, which makes it an interesting pharmaceutical component. Ultrasonic extraction is an excellent technique to produce high yields of caryophyllene oxide, e.g. from cannabis and hops. 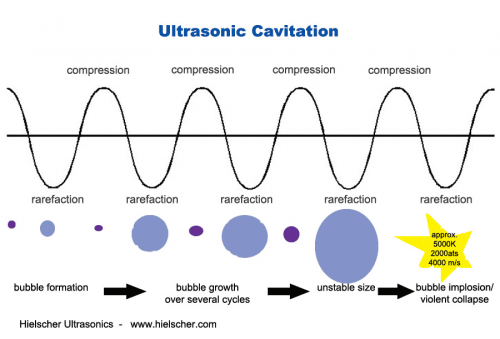 Read more about acoustic cavitation, the active principle of ultrasonic extraction! As example, β-caryophyllene oxide was ultrasonically extracted with the ultrasonic device UP100H (100W, 30kHz) from dried hops buds. The GC analysis data shows the extraction yield of β-caryophyllene oxide, extracted with Hielscher’s UP100H from hops. Gas chromatography analysis of ultrasonic hops extract: β-caryophyllene oxide, α-caryophyllene, α-pinene, mycrene, limonene, α-caryophylene, and caryophyllene oxide and others. Besides β-caryophyllene oxide, other terpenes such as α-caryophyllene, α-pinene, mycrene, limonene, and α-caryophylene amongst others were successfully extracted. 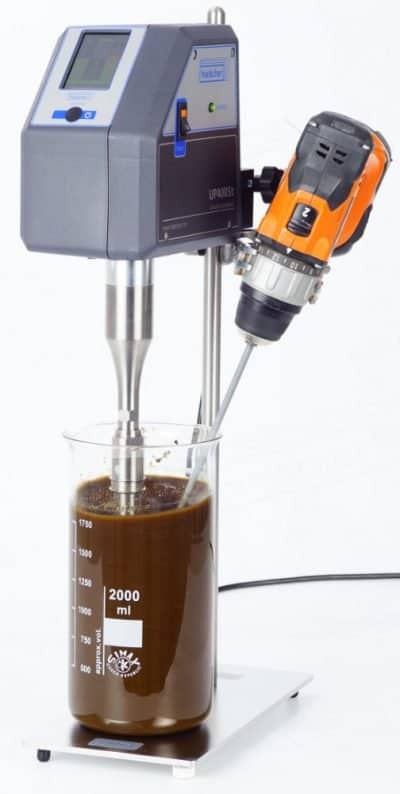 The hops was ground with a conventional coffee grinder to obtain a more homogeneous particle size of the hops sample. 4.5mg of hops was put into a vial, then adding 5mL of ethanol. The vial was placed into a beaker with ice water for heat dissipation. Then, the sample was sonicated with a UP100H, equipped with sonotrode MS7, at an amplitude setting of 50% for 90sec. Sonication ensures a high mass transfer between the cell matrix and the solvent, so that consequently a very high yield of high quality extract achieved. Ultrasonic extraction stands out as a green extraction method, that allows to accelerate the extraction procedure significantly whilst requiring only less energy than other conventional extraction methods (i.e. supercritical CO2, Soxhlet etc.). Other advantages linked with the use of ultrasonic extraction are easy handling of the ultrasonic extractor, rapid process, no chemical waste, high yield, eco-friendly, enhanced quality due to mild processing conditions and the prevention of thermal degradation. The table below gives you an indication which ultrasonic device might be the most suitable for your process requirements. High-power ultrasonic homogenizers from lab to industrial scale. Selvamuthukumaran, M.; Shi, J. (2017): Recent advances in extraction of antioxidants from plant by-products processing industries. Food Quality and Safety, 2017, 1, 61–81. Caryophyllene or (−)-β-caryophyllene, is a natural bicyclic sesquiterpene that can be found in many essential oils. The following herbs are known as a good source of caryophyllene: cannabis, hemp (Cannabis sativa), black caraway (Carum nigrum), cloves (Syzygium aromaticum), hops (Humulus lupulus), basil (Ocimum spp. ), oregano (Origanum vulgare), black pepper (Piper nigrum), lavender (Lavandula angustifolia), rosemary (Rosmarinus officinali, and copaiba oil (Copaifera spp.). β-caryophyllene is a phytocannabinoid with strong affinity to cannabinoid receptor type 2 (CB 2), but not cannabinoid receptor type 1 (CB 1). Caryophyllene oxide (also β-caryophyllene oxide) is the oxidation derivative of β-caryophyllene and is a white crystalline solid powder with a melting point of approx. 62°C. It is valued for its anti-inflammatory, local anesthetic, and antioxidative effects. First research suggests that caryophyllene oxid might be a potential drug for cancer treatment, too. Caryophyllene oxide is part of the cyclobutane ring, which is already used in medical research in order to synthesize the widely used chemotherapy drug carboplatin. Caryophyllene oxide, in which the olefin of caryophyllene has become an epoxide, is an approved component for food flavoring. Both, β-caryophyllene and β-caryophyllene oxide exhibit low water-solubility, which impedes their absorption to the cell. To use these sesquiterpenes as medicinal drugs or nutritional supplements, the encapsulation into liposomes overcome the poor solubility of these sesquiterpenes in aqueous fluids and ensure bioavailability and bioactivity. Click here to learn more about the ultrasonic encapsulation of bioactive compounds! In the cannabis sativa plant, caryophyllene oxide is found as a sesquiterpene, which consists of three isoprene units. Caryophyllene oxide is one of the largest and most abundant terpenes in the cannabis plant and is responsible for the distinctive aroma and smell of cannabis. Ultrasonic extraction is successfully applied to produce full spectrum cannabidiol oils, so that the entourage effect of the manifold compounds is given. When high-power ultrasound waves are introduced into a liquid, compression and expansion (rarefaction) cycles occur in the fluid. During rarefaction voids or so-called cavitation bubbles are generated in a liquid. These cavitation bubbles, which are tiny vacuum bubbles, occur when the negative pressure exerts, so that the local tensile strength of the liquid is overcome. The vacuum bubbles grow over several compression / rarefaction cycles until they cannot absorb more energy and the cavitation bubble undergoes sn implosive collapse. This phenomenon is known as cavitation. According to Prof. Suslick’s research (1990), in cavitation bubbles prevail extreme conditions with temperatures of up to 5000 K, pressures of 1000 atmosphere, heating-cooling rate above 1010 K/s and liquids jets with up to 280m/s velocity, which appear as very high shear force and turbulences in the cavitation zone. The combination of these factors (pressure, heat, shear and turbulence) is used to accelerate mass transfer in the extraction process. Moreover, these locally occurring conditions are also used in ultrasonic processes, such as homogenization, emulsification or dispersing. Firstly, the solvent (surrounding liquid medium) is pushed into the cell matrix. Depending on the amplitude and strength of cavitation, the cell wall is perforated or disrupted by the liquid pressure. Secondly, during the rarefaction cycle the content of cell (i.e. intracellular material) is flushed out of the inner cell. 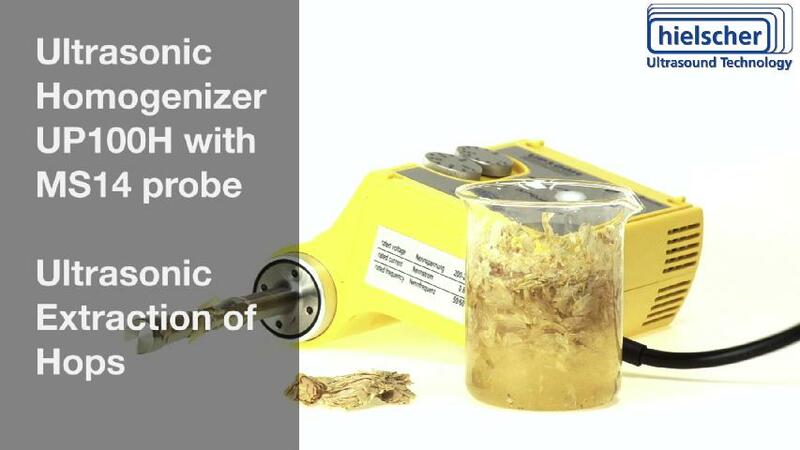 After ultrasonic extraction, the targeted compounds are in the solvent and can be separated from the solvent (e.g. by evaporating the solvent) so that finally a pure extract is obtained. The composition of the raw material (such as moisture content, maceration / milling degree and particle size, and the selected solvent are very important factors in order to obtain an efficient and effective ultrasonic extraction process. The ultrasonic process parameters are essential, too: amplitude, pressure, temperature and sonication time must be established and optimized for best results.